Some tools allow you to specify multiple entries for a particular parameter. 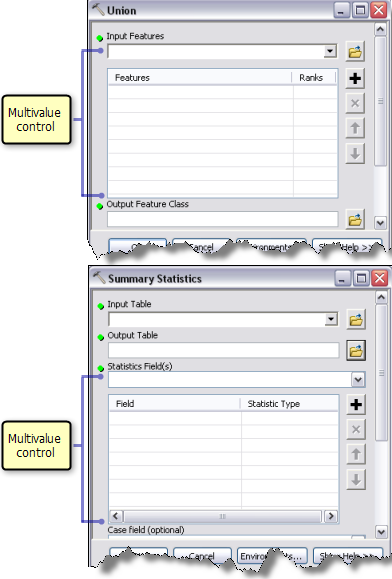 For example, you can include multiple datasets for the Input Features parameter in the Append, Union, and a number of other tools, or you can include multiple fields for the Statistics Field(s) parameter in the Dissolve and Summary Statistics tools. These parameters, as shown below, use the multivalue parameter control, which is a bit more complex than the majority of controls you'll use. Use the browse button to locate a feature class. This feature class will be added to the list automatically. 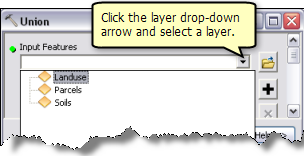 Click the layer drop-down list and select a layer. This layer will be added to the list automatically. Type in the path of a dataset, then click the Add button . 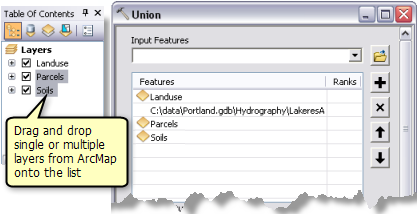 Drag and drop single or multiple layers from ArcMap onto the list. Drag and drop single or multiple datasets from Catalog window onto the list. To remove an entry from the list, click the row to select it and click the Delete button . The entry order in the list may matter to some tools. 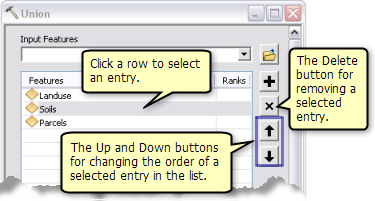 To change the order, click the row to select an entry and click the Up or Down arrow button to move it in the list. The Up and Down arrow buttons are always available, even if the entry order doesn't affect the output of the tool. Read the documentation for the tool you're using to see if the order has any effect. In the entry list, there may be additional columns that give more control to the process. One example is the Ranks column in the Union tool. 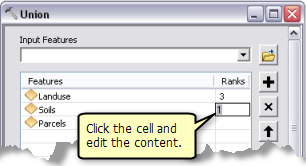 To change the rank for a particular feature entry, click the cell and edit the value. 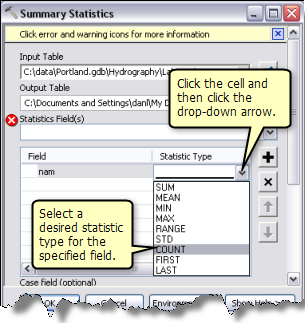 Another example is the Statistic Type column in the Summary Statistics tool. In this case, when a field entry is specified, a red warning sign indicates that a statistic type is required for the field. You can click the cell and click the drop-down arrow. The available statistic types will be listed; you can now select a desired type.